Island Gem. A special place to relax and recharge. Condo, 2 Bedrooms, 2 Baths, (Sleeps 2-4). Looking for a condo that is close to good restaurants and tourist attractions, but away from the 7 Mile beach 'scene''? Within 20 minutes from the airport (direct flights from New York, Toronto, Chicago, Miami), 5-10 minutes to Seven Mile Beach, and a few minutes to the closest dive shop, our condo is a convenient, yet private location. Enjoy walking, snorkeling, or relaxing in a chaise on Pappagallo Beach, the last unspoiled, and undeveloped beach on Grand Cayman. We are the only condo development on this gorgeous 2 mile stretch of pristine white beach against a multitude of turquoise variations. Adjacent to the National Park, Pappagallo Beach is abundant with marine and wildlife…a snorkeler’s and naturalist’s dream come true! Hiking trails, bird watching, kite sailing, and picnic activities are all available in the park. For those who like to fish, there are plenty of meals waiting to be caught right off the beach, and great bone fishing nearby. For the 'foodies' or anyone who enjoys a good meal, the best and most interesting restaurants are within minutes of the condo. Your major decision will trying to chose which restaurant to go to. There are a lot of rally great restaurants on the island and most of them are very close to Pappagallo. This is a place where R&R is the number one priority. You can be as active, or inactive as you want. If you want to be part of the tourist scene of jet skiers, para-sailing, bars, cruise ship scene etc., Seven Mile Beach is just minutes away. If you want to sit on the beach with a good book, listen to the waves, watch the birds, dig your toes in the sand, count the shades of blue (so far, the list is at 80), and give yourself some space to re-charge, your chaise awaits you. Our guests regularly tell us that it is the best vacation that they have had, and consequently, we have many repeat visitors. We take great pride in providing a very high standard of comfort, hospitality and an environment that is more than the average rental property. The décor, furnishings, appliances etc. are continually updated in an upbeat, island style. For those who like to cook, the kitchen is well-equipped with everything you could need, for those who prefer dining out, there is one of the best restaurants across the street, and another five minutes away. There is also take-out food and a grocery store nearby. The condo has been set up with focus on comfort, efficiency and a great vacation experience. The condo is exceptionally light, clean, large, spacious, and uncluttered. Our guests repeatedly tell us that the unit is everything if not more than they expected and and how much they appreciate the welcoming ambiance and upbeat beach decor in white with splashes of tropical color. The unit is equipped with WIFI, cable TV, central air-conditioning,blow-dryers, games, and puzzles. There is a king size bed in the master and twins in the second bedroom (can be made into a king) and nearly everyone comments on how comfortable the beds are. There are four balconies with views off the unit and comfortable Muskoka chairs off the living room. The sunken living room has extra high ceiling which makes the unit feel larger and spacious. The unit is larger than many of the two bedrooms in the complex and the combination of good design and good furnishings make for a very comfortable living experience and consequently more enjoyable vacation. Our condo has superior views, is excellently equipped, is regularly updated and is one of the best condos in the complex. The second floor bedrooms and bathrooms have been renovated in September of 2015. At this condo you will receive a pre-vacation information package, be properly received by an appointed on island representative who will 'meet and greet' you and make sure you are comfortable with the apartment, and you will have 24/7 back-up emergency support system if needed. You have the peace of mind of knowing you have an invaluable organized support system before your trip and emergency back-up during your stay. Many of our guests tell us that the effort that goes into making their stay as informative and safe as possible is an added bonus that means a huge difference to their overall vacation experience. The attention to detail and extra TLC are some of the reasons many of them come back again. Having owned our condo for over thirty years, we have enjoyed sharing knowledge and experience with our guests in the hope that they leave with wonderful memories of their own. We spend a lot of time and energy to make this property a 'special place' and so far we are continually told that we surpass expectations. If you would like to know more about this condo, please feel free to contact us. 4. Close to the best restaurants on the island. We are a Canadian family who have owned at VP for over 30 years and love it as much as the day we bought. We enjoy walking the beach, watching the seabirds, snorkeling off the jetty, and experiencing the Cayman 'laid back' lifestyle. Sometimes our main activity/accomplishment is if we can figure out what to have for dinner and it usually means walking across the street to one of the best restaurants on the island Restorante Pappagallo! We have always loved that all the amenities are close by within 5-10 minutes, yet we can still get away from the 7 Mile Beach hustle and bustle to a very natural setting with the 'old Cayman' relaxed ambiance. The Best of both worlds. We also know that this condo complex is the best price value on the island. The condos are big, spacious, with wonderful views. The lovely high ceilings make them feel even bigger. We have amazing views and a wonderful cross breeze. The condo is spacious, comfortable, clean, well appointed and regularly updated in an upbeat island style. Our guests tell us that they appreciate the small touches and comfortable beds. We are fully licensed and meet all the Department of Tourism requirements and we ensure that our guests have all the information they need before they leave as well as good back-up once they are on island. Our week at Villa Pappagallo could not have been better. A spacious, clean and well-stocked condo with a great view of the pool and beach. There is an excellent restaurant right across the street, but you will definitely want to rent a car. That's so you can check out the Sticky Toffee Pudding at the Calypso Grill. As an added bonus, if you fly Cayman Airways from Chicago you're there in four hours with no connecting flight. Great trip! Wonderful condo, very well maintained with everything we needed. Lee was especially hospitable and helpful throughout. Only thing worth noting is that our 3 year-old daughter really couldn't swim in the ocean between the coral right in front of the beach and the currents past them even if you go off the end of the dock, which were windier and rougher than Seven Mile Beach. However, for the space, condition of the apt, beach front location with rare privacy and gorgeous views from our balcony, thought the condo was terrific value and really appreciated Lee's warm hospitality. Looking forward to returning to Grand Cayman! Our two weeks at Villas Pappagallo unit #41 was just what we needed. This condo is spacious, well-appointed and comfortable. The view from the private patio of this unit across the lovely pool to the beach and ocean is hard to beat. The temperature of the well-maintained pool was perfect for us and there is plenty of seating and umbrellas around the pool as well as chairs and loungers at the beach. We enjoyed a trip to Rum Point and spent a day in Georgetown and on both occasions we had a really good lunch. There are numerous good restaurants around and we would say that The Cracked Conch was our favourite. A little slice of paradise. Thank you for the wonderful review Joanne. We appreciate all the positive comments, but most of all so happy that you had a good vacation. Hope to hear from you again. 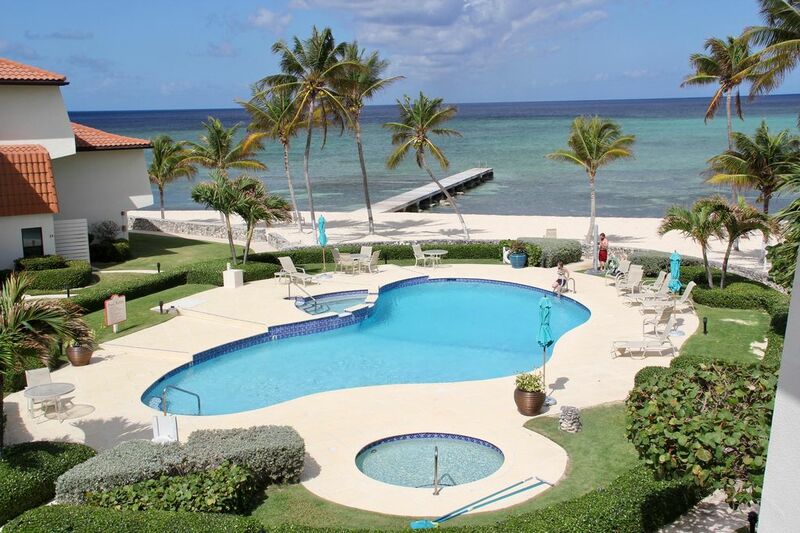 We had never been to Cayman before and we booked this condo based on location (away from 7 mile beach area) and value. We were not disappointed! We rented a car so we could drive around the island and get into the action when we wanted to but then we could also go back to our quiet, secluded condo. This condo is beautiful inside and out. Lee has decorated it with great style and taste! It is very clean inside and out. Lee was a pleasure to work with, answering all of my countless questions! She provides anything you might need for the week and also has very comfortable beds with luxurious sheets and towels. This condo is spacious! Lots of room to move. There are lots of beach towels so you don't have to pack your own. The views from the condo bedroom and living area are breathtaking! This complex is near many good restaurants within driving distance and even Pappagallo, which is right across the street. Our favorite restaurants were; Catch, The Cracked Conch, Macabucca and Guy Harvey's Restaurant. We traveled with our two kids ages 13 & 10 and they LOVED Grand Cayman. We would definitely stay at Starfish Villa again. I just returned from a week long stay at Starfish Villa. What an amazing place! The location is the best on the island! Starfish Villa is in Villas Papagallo, which is a relatively small low rise condo complex with a private pool and beach that feels like it is your own. We spent hours walking along the beach, enjoying the warm breeze coming off the ocean. The grounds are beautifully maintained and the views from the balcony breathtaking. The condo itself was impeccably clean and nicely decorated. The rooms are spacious and the beds very comfortable. The kitchen is well equipped, so cooking in was a pleasure. However, we did eat out a couple of nights and can highly recommend Ristorante Papagallo which is right across the street and Agua which is about 10 minutes away. Grand Cayman itself is lovely. The people are very helpful and everywhere we went we felt safe. I would recommend renting a car and driving around the island. There are many beautiful beaches and the snorkelling is awesome. There is no question we would go back! My husband and I spent a week here for our honeymoon in April. We could not have asked for a more perfect getaway. Lee was responsive and resourceful right from the start. She answered all of our questions and made sure we had a thorough list of what to expect upon arrival and throughout our stay. We arrived on a Sunday afternoon and were welcomed at the Villa. We were given a tour of the Villa and had an opportunity to ask questions and get settled. The condo was better than we had expected - the photos of this property do not do it justice. The kitchen is fully equipped, living room is comfortable, bedrooms are large and the bathrooms both include a shower with great water pressure. There is a dishwasher and washer/dryer right in the unit. The entire condo is very tastefully decorated. Everything you could possibly need for a comfortable stay is here, it's just like being in your own home. The beds were comfortable with soft, clean sheets and plush pillows. There were more than enough beach and shower towels. There is a TV with cable and plenty of board games. Each room also has a large closet and has an outside balcony with seating. The balcony off the living room overlooks the pool and beach area, providing an excellent view of the property. Villas Pappagallo is secluded from the rest of the island, providing a relaxing, secluded area to refresh and rewind. There is a national park directly beside the Villas with a beautiful, natural landscape and a perfectly quiet place to walk along the beach. Seven Mile Beach is a short car ride away and Georgetown just a bit further. The entire island is accessible from Villas Pappagallo. We were so pleased to be staying in West Bay. Our two favourite restaurants were Ristorante Pappagallo and Cracked Conch, right in West Bay. Ristorante Pappagallo is just steps away from the Villa. The snorkelling and sunsets on West Bay were also highlights. We took a trip to rum point for an afternoon for snorkelling and lunch. This is an easy day trip in the car. There are so many things to see and do on the island, but we spent most of our days on the beach right out front Starfish Villa. The property was quiet and all neighbours were friendly and respectful. We cannot wait to come back to Grand Cayman. We will absolutely stay at Lee's condo at Villas Pappagallo again. I cannot think of one single disappointment or criticism. Great Vacation!! Thanks for the amazing review Erin! So glad that the condo exceeded your expectations and that you found the location to be easily accessible to everything else on the island (and close to the good restaurants). Rewarding for me that you noticed the extra effort we put into making the condo comfortable and a home away from home. Look forward to seeing you again soon.